Ledgerx has recently become the first exchange to offer regulated cryptocurrency derivatives trading, but – as the people behind the operation will be quick to point out – LedgerX is so much more than just an exchange. For the time being, the public will know the operator as the platform which saw some $1 million traded through swaps and option contracts within its very first week of existence, underscoring the need for a regulated platform/clearing operation featuring this type of services. The people behind LedgerX define the operation as a “US exchange and clearing house,” a definition which carries further-reaching consequences than one would think at first glance. It also means that this LedgerX review will be somewhat outside the mold we generally use for our reviews. First of all, having been defined as such, LedgerX can rely on a single federal regulator, like the CFTC, which is not just convenient, but also highly experienced and competent. Well above and beyond the scope of LedgerX itself, the setup the operation has managed to build up over the last couple of years – according to most: against all odds – is one that might potentially open the floodgates to proper institutional involvement in cryptocurrencies. That would obviously result in billions upon billions of dollars added to the market caps of currencies such as Bitcoin and Ethereum, and a corresponding rise in the prices of these virtual coins. Still, there’s more up the sleeves of this shrewd operator. The draw that the platform already represents for institutional investors, on account of its solid regulatory status, and straightforward interface, cannot be denied. Any asset management company, hedge fund or trading advisor, will find that a completely safe and regulated foray into the world of cryptocurrencies makes perfect sense through LedgerX. Not only that, but actually making that move has been simplified too. So what exactly is it that LedgerX offers to retail clients? In layman’s terms, LedgerX are preparing for a world where cryptos such as Bitcoin and Ethereum coexist with fiat currencies such as the USD and the EUR. The stated mission of the operation is to become a sort of interconnecting web between various fiat and crypto currencies, by making it easier to convert one to the other. LedgerX want to make the conversion of BTC into USD or ETH into EUR just as easy and straightforward, as the conversion of USD to EUR is these days. For the currently hair-raising volatility around cryptos to be tamed, institutional involvement in the cryptocurrency derivatives market is required. This is the incredibly complex role LedgerX is looking to fulfill in the future. The About Us section of the LedgerX official site offers a peek behind the scenes of the already successful operation. Apparently, the first fully regulated clearing house and exchange, offering fully-collateralized Bitcoin swaps and options, has enlisted the help of a number of CFTC, MIT and Goldman Sachs veterans. The Board of Directors boasts names such as Ananda Radhakrishnan, the former director of the CFTC’s Division of Clearing and Risk, alongside the Gelber Group’s Carl Mahler. Legitimacy is obviously not a question as far as this LedgerX review is concerned. Under the regulatory wings of the CFTC, the operation is the first of its kind in the world – as detailed above. Ledger Holdings Inc. is the corporate entity behind the exchange, and Google Ventures is one of the early investors. Besides the advantages stemming from its nature and its regulatory status, LedgerX brings a number of other important strengths to the table. One such obvious strength stems from the relationships the exchange has developed with some high-profile banks. Given that the institutions working with LedgerX in this vertical possess combined assets in excess of $500 billion, it is safe to say that the exchange is the world’s top Bitcoin operation in this regard. Why is the banking aspect so important for an operation like LedgerX? It makes the operation of the clearing accounts much faster, and more cost-effective, advantages which get passed right down to the client-base. Integration is another crucial aspect of the operation. Because everything is built in-house and nothing is outsourced, LedgerX offers unparalleled flexibility and speed in the execution of trades and its clearing operations. As said, LedgerX’s is much more than an exchange. It is a clearing house as well, meaning that it is fully capable of guaranteeing derivatives trades on its own. This clearing house/exchange combination gives it a superb edge integration- and cost effectiveness-wise. It never has to deal with the whims of an outside clearing operation – like other exchanges- and that fact alone is a major advantage indeed. The financial robustness of the operation cannot be questioned either. Having ridden some very healthy financing to its launch, the operation is indeed in a position to work for many years. 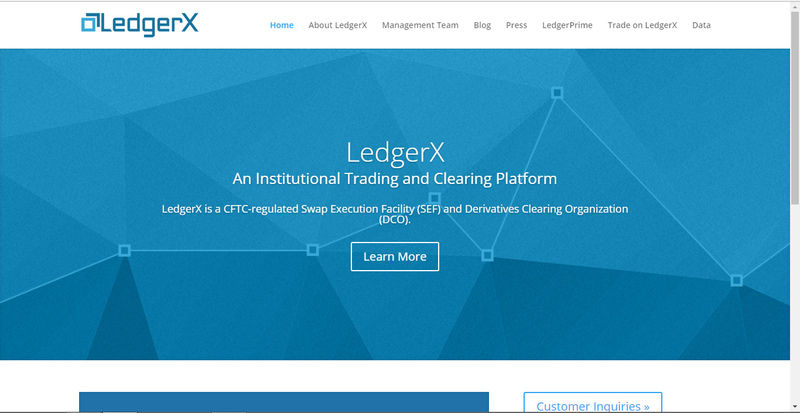 Through its CFTC regulation, LedgerX has also come close to global reach. While not quite there yet, the fact that the CFTC has struck up agreements with a number of international regulators concerning the harmonization of the regulatory frameworks used, certainly places it within arm’s reach. Being a swap execution facility has allowed LedgerX to offer a number of unique financial products, such as their Day Ahead Swaps. The Day Ahead Swaps come with a bunch of favorable features, such as a minimum tick size of 25 cents, and a minimum contract size of 1 Bitcoin, which brings it pretty close to the S&P 500 Future Contracts in terms of liquidity and size. When this review was posted on October 28, 2017, LedgerX was already a slightly popular website with a global SimilarWeb rank of 893,327. Most of ledgerx.com’s traffic seems to originate in the United States, as can be expected from a US regulated trading platform. This LedgerX review may not be a conventional one, but then again LedgerX is not a conventional operation. It is a fully licensed US exchange and clearing house, not to mention Swap Execution Facility, the impact of which on the crypto-markets may indeed be massive in the future. Its unique products and its ambitions paint a very promising picture of the operation and its financing is testimony to the fact that it has managed to impress high-profile investors too. Would love to hear your thoughts about this service! Feel fee to leave a comment below. Also, you’re invited to subscribe to ScamBitcoim.com to receive all our latest reviews via email!